The following is a guest post by Eduardo Bouças. We all know WordPress is a CMS, but here Eduardo thinks about using it only as an API for content. No front end at all, just URL endpoints that return JSON for use anywhere else. This doesn't detail a comprehensive solution to doing this, it's food for thought with some example code to get you going on a custom solution. If you want to get started developing on a system like this right away, WP REST API is the most robust project with the most momentum. I was recently asked to choose and implement a CMS solution for a digital agency to manage multiple websites in a single installation. For a huge number of reasons, the prime candidate was WordPress. It's free and open-source, has a huge user community, it's easy to use, and has a multisite feature. It's unquestionably a commercially-proven and mature product. But, I had my reservations. I've always envisioned content as the center of everything on a website. The nature and creative concept of each individual project should dictate what medium and technologies can best deliver the content, not the CMS. I don't want to have my technology choice for a project limited to PHP just because WordPress is built on it, and I want developers to have the freedom to choose whatever technology stack they see fit to create independent and self-contained websites, not just WordPress plugins and themes. This "middleman" layer is capable of speaking a universal language (JSON is my preference) that different end platforms can understand and process in a way that suits the project. Our API-first WordPress won't have any of that. The only input we'll accept from users will come in the URL of the requests they send, which we'll have to parse in order to extract the type of data we need to deliver, the format, and the filters to pass it through. So let's start laying out the foundations for our plugin. It's a good practice to wrap the plugin in a class construct to avoid polluting the global namespace with loose functions, potentially leading to naming conflicts. As this point we have a very basic API that allows us to pull entries from WordPress based on a set of filters, which may be enough for a very simple project. But what happens when we need to get multiple sets of data to render different elements on a page? It doesn't seem reasonable to send multiple HTTP requests. 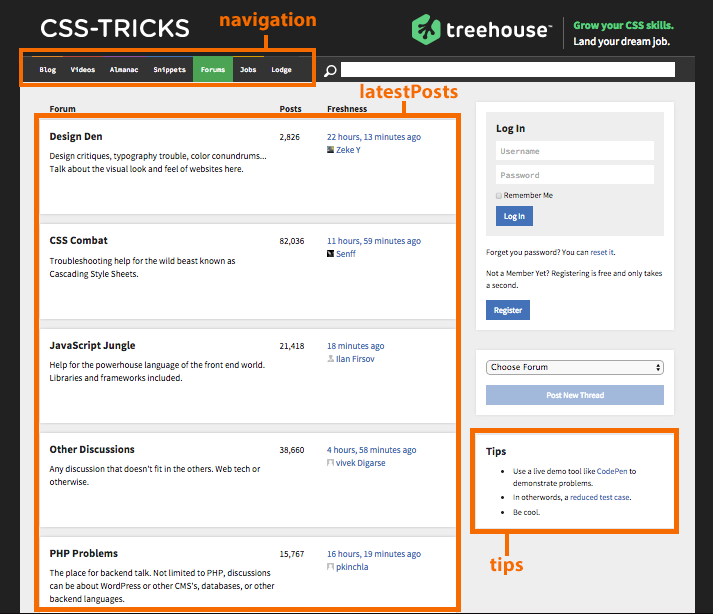 Take the forum page on CSS-Tricks as an example. Beside some meta data that we'd probably need, there are at least three distinct sets of content to pull from the CMS: the items on the navigation bar, the latest posts, and the tips. We can define our own custom syntax for the API so it accepts the definition of "content buckets" on-the-fly and returns them compartmentalized as a JSON array in the response. Update from the editor: Eduardo created an extension plugin for WP-API for doing this! Check out the GitHub repo. Our JSON representation of posts relies on the information returned by get_posts(), but there are some things missing there that you'll probably want in your feed, such as image galleries and custom fields. We can append that information ourselves to the JSON feed with the help of the functions get_post_galleries_images() and get_post_meta(). The solution described in this article barely scratches the surface of what building an API entails. We haven't touched on things like authentication, request types for write access (POST, PUT, DELETE), multiple endpoints for different types of content (users, categories, settings), API versioning, or JSONP support. Great article! Would your typical caching plugins (WP Super Cache, W3 Total Cache) also cache requests through this API? I’m thinking it might since you’re using get_posts(). Super interesting! I’ve been kicking a similar idea around in my head for a while now too, ever since the WP REST API gained momentum. While your proposed solution is indeed clever, I feel like maintaining both a WordPress plugin, a WordPress installation (hosted probably elsewhere from the front-end) AND a front-end could be a little overwhelming. I’ve kind of settled on the thought that the REST API will actually work great for building “web applications”, with just a custom theme for the front-end. The cool thing then though is that you can use that same API that your web application is using and retrieve/post data from, say, your iPhone app. I’ve been using wordpress as a CMS for a couple of years, firstly with a Coldfusion ‘front end’ and more recently with a PHP ‘front end’. While not an API as you’re proposing (which is a great idea) it still uses wordpress as a data entry tool and renders the pages out into non-wordpress front ends. I’m excited by the REST API, but I can’t help but wonder what the difference would be between the WP REST API and something like Laravel, or it’s new, slimmed down version Lumen? Don’t get me wrong, I think API’s are for the benefit of developers and readers alike, but how will WordPress make development unique from competitors. In my reading on the subject it always sounds like the goal of this project is to shy away from the content management aspect of WP and leave it to other frameworks to figure out, to be more like a hot-swap of components a la composer, or even node.js. But what I find great about WordPress is how it handles theme and content development, with a robust and user-friendly admin UI. Does anyone know if/how the wordpress back-end / admin UI will change alongside WP API? I used WordPress to write the documentation for my product. The documentation is served in different end-points, so I didn’t want to use WP’s front-end. I used the API here. With WordPress back-end, I was able to create and manage the content. I can’t use Laravel to create, or manage content. I’ve been using WordPress for this recently. The WordPress front-end then becomes the interface for management of the content. I mis-used the Toolset tools (http://wp-types.com/) for creating various relevant custom content types, and for creating forms for managing the data. The API interfaces then have to understand the custom content database structure. When you say “article barely scratches the surface of what building an API entails…”, I couldn’t agree more. What if you would like to have multiple API keys for different output channels? Or deliver to difficult mobile network environments? Or rescale media assets depending on output format? Or bundle requests to minimize mobile network latency? Or sync the delta of changes from a certain point in time? Or programatically create content via an API as well? Or scale to millions of requests per hour without breaking the WordPress database bottleneck? 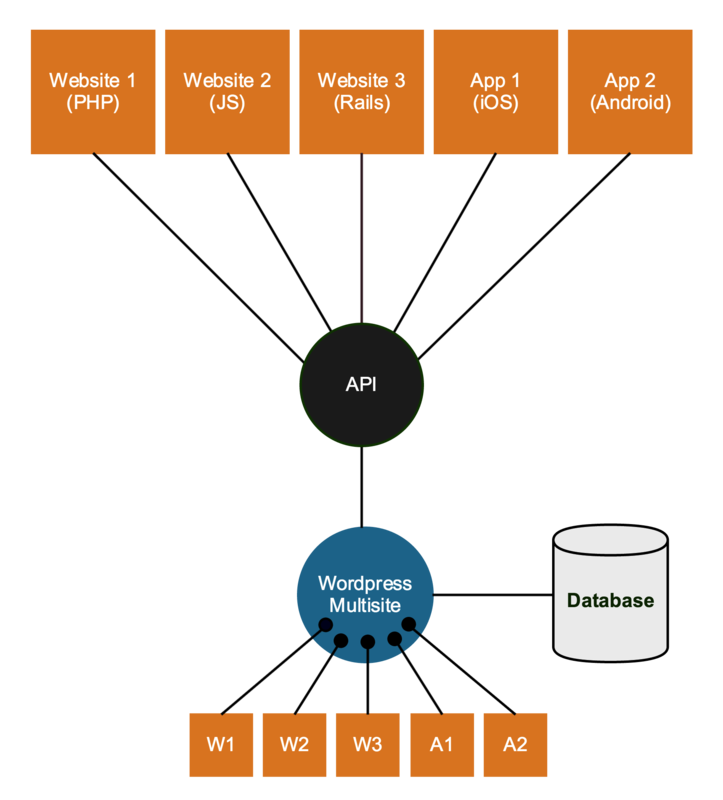 Before reinventing the wheel, you may want to check out some of the systems that has been designed from the ground up for API delivery, like e.g. Contentful. I think that both me (throughout the article) and Chris (on the introduction text) did a good job at making clear that this is just food for thought and not a complete implementation. I’m not trying to reinvent the wheel, but I think that if you give people a rough idea of how an API could work in a scenario like this, they can be better informed when it comes to choosing an existing solution, and hopefully power them with some knowledge to extend the solution with their own features. I personally find that more useful than an article saying “Hey, want an API-first solution? Buy this”. @Chris, how many shares do you have in Contentful? The writer states that this article is just a few thoughts he had about best practices/idea, and by the fact it’s been published on this site, it clearly has a place and is a worthwhile read. The whole point about writing your own API is to learn and understand, so pooping on other peoples ideas in order to promote a paid for alternative is really just bad form on your part. Learn to love the community Chris, learn to love. I agree that WordPress is not the more obvious platform to build an API-first solution, and the benefits of using an alternative that is built with that mindset from scratch are clear. However, that sometimes might not be enough to counterbalance the benefits of a widely used platform like WordPress. What if the client relies on dozens of external editors to insert and manage the content? Will you provide them with training on how to use your Drupal-based API-first solution? Because the chances are most of them know how to use WordPress and some of them never heard of Drupal. And that’s just one example on where a WordPress solution might be a good option. Your point was that the implementation presented in this article is reductive. Agree with you there. But I think it’s even more reductive to say that WordPress is forcefully a bad choice. The whole point of this article was to entertain the idea of taking WordPress (and the benefits it brings) and make such a non obvious combination with an API-first approach. Whether it works or whether it’s the right choice of technologies depends on a huge number of variables and circumstances. Don’t forget, WordPress already contains a handful of JSON-related functions that cover sanitizing, validation, output, etc. The example’s writeJsonResponse() is largely a rewrite of wp_send_json(). True! My idea behind writing a separate function was so you could send responses with different response codes. I guess I could use wp_send_json_success() and wp_send_json_error(), but this felt a bit more flexible. But that’s a good shout. Thanks! I have also played around with a few basic concepts like this. Add to the reasons why this concept is interesting the fact that you could also develop a front-end that is CMS agnostic. By having a well structured API response from whichever CMS you’ve chosen, your app/browser simply calls the API and receives the JSON it needs. This is a little bit like creating a CMSMS as that is what the CMS is supposed to do; Interface with your data and allow you to display it in your chosen format. However, with WordPress (and other CMS) builds being used for such a broad range of use cases, I’m sure there are people that could find a use for this extra layer. This should be called headless Drupal, especially if you would use angular.js as front-end. There is a similar development with Drupal. What many don’t know was that you could use open office in a similar way as a data repository say 12-15 years ago. If you would call this headless WordPress then the geeks will see the parallels more clearly. I would be curious to know if this model has been used on a big website ? I am thinking about doing that for my site and I am still seeking informations. Thank you for this link. Very interesting. But, do we really need to use multisite for this ? I mean, the way multisite works in WP seems to be too much whenyou don’t use standard WP front. It seems to me that it would be easier to just create one categorie for each site (and maybe subcategories), using WP REST API to communicate with the front, without activating multisite. Am I missing something here ? No, I don’t think you are missing anything. The author of this article just happened to use multisite because it probably fit his needs best, but I believe you are correct in that for some projects you wouldn’t need it. I don’t see why you couldn’t just grab posts from different sites according to their categories. It just depends on whether that’s a sufficient solution for your project. I’ve been using wordpress as an API for a while now, created my own API plug in for it. It works pretty well and cuts down a lot of the the server load. I had a few auth issues but you can add some of that stuff into the core system with a bit of messing about and it works great. A “Modular” WordPress would be fantastic. Imagine you could have the logic, backend, and frontend parts (and you could probably break it down into many more parts) of WordPress as separate modules. I personally love the WordPress backend. It would be great if I could simply patch that backend into my project with none of the rest of WordPress. Or maybe you already have a backend and simply like how WordPress handles the logic. You could plug the logic module into your project and make it work with your backend while not having to install all of WordPress. Yeah that would be very helpful if one could just pick the backoffice – without the code dedicated to the front/theme/plugins stuff. But this is not a common use of wordpress (for now). I thought I had a genius idea when I thought to do that but, of course, some guys beat me to it, like Eduardo here. I would love to chat with him about that to learn some more.